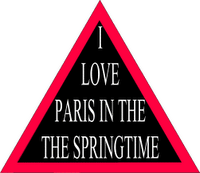 Ok, it's not the springtime but I am in Paris and this still remains a popular optical illusion. Go on, what does it say.....are you sure? I've never been able to make my mind up how much I like being in Paris but it's undeniably beautiful, even if it is full of French people (in common with many towns and cities in France). However one thing I can observe, particularly given I have spent so much time in London and New York, is that it lacks the energy and dynamism certainly of the latter and increasingly of the former. "Pah" you might say, before giving a nonchalant Gallic shrug. However Paris and France in general will eventually have to give up either their extraordinarily generous welfare and employment benefits, or they will have to give up their admirable quality of life unless they want to become Europe's answer to Argentina (formerly known as the 7th richest country in the world). Many French cities including Paris are unusual because the inner cities are where the rich and the intellectuals live, whilst the poor are banished to the suburbs; I suspect for example that there isn't a direct French translation of 'stockbroker belt.' However if the riots this time last year in the oft-forgotten suburbs of Paris taught the establishment here anything, it should have been the dangers of running an economy with 10% unemployment yet one where starting companies and creating jobs is as bureaucratically burdensome as virtually any other developed nation. Still, I may as well enjoy it whilst it lasts. I'm off now to find a copy of Le Monde, a packet of Gauloises and a café where I can ask the locals whether Talal el Karkouri also suffered from the long ball that bounced just in front of him when he played for PSG. Wat More Can We Do?